Help CentreUsing SuperControl Managing bookingsHow do I add an admin booking? It’s up to you what your preferred option is, however the grid view is our most popular method. How do I add a booking from the grid view? 1. Go to Bookings > Grid view. 2. Click on the arrival date corresponding with the property that you want to book. Next, select the number of nights requested for the booking. 4. On the next screen fill out the booking form and check that you have listed all the guest details. You can also amend your price if required and then press ‘Save’. 5. Your booking is now saved. The booking will prevent any other person trying to book the same dates for that property. 6. If you navigate back to Bookings > Grid view you will see the booking you have just added. To go into the booking click on it. Grid defaults: At the top of your grid view you will see a button called "Grid defaults". 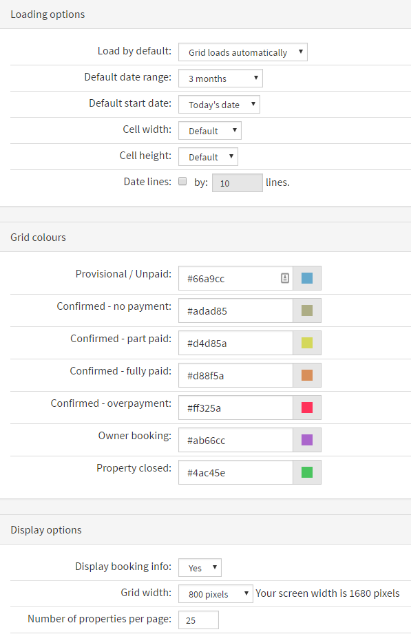 In here you can choose colours to display for your bookings, how many months to show and set your grid to load automatically. 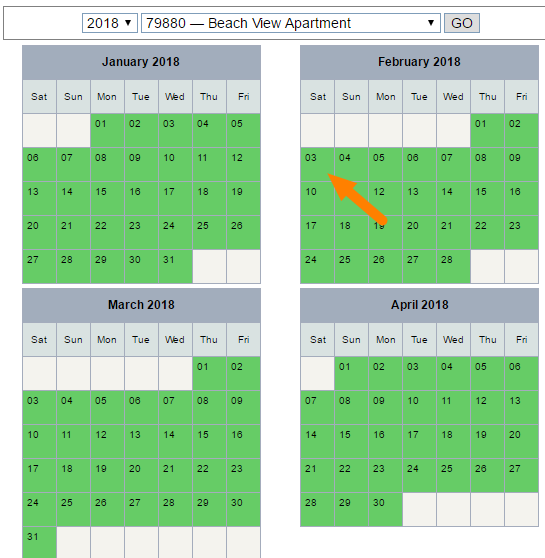 How do I add a booking from the availability search? 1. Go to Bookings > Availability search. 2. Select your holiday dates and filter options then click ‘Search’. How do I add a booking from the Add bookings page? 1. Go to Bookings > Add bookings. 2. Select your arrival date and load the calendar for your chosen property by clicking ‘Go’. 3. Click in the green available date for the arrival date, then enter a departure date or select the number of nights. 4. Underneath fill out the booking form and check that you have listed all the guest details. You can also amend your price if required and then press "Save". Prev: What’s the difference between an ADMIN booking and a WEBSITE booking? Next: Is there a preferred method of adding an admin booking?